The Color Me Rad 5K Run is coming back to the Omaha area at the Mid-America Center on Saturday, May 11th, and we need your help! All your hard work last year made the 2012 Color Me Rad a HUGE success and we need you again to make 2013 even better! To volunteer at this RAD event, fill out the form by clicking the link below by April 8th! Omaha runners are gearing up for a lot more color, and even more radness, as they take on the return of Color Me Rad 5K on May 11, 2013. 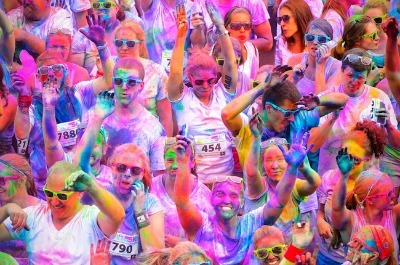 As white-clad participants run through Mid-America Center they’ll be bombarded with color that tie-dyes their t-shirts at the same time it brightens their outlook on life. In this untimed event, the focus is purely on fun, and the fitness is an added bonus. After completing the 3.1-mile course, runners will declare themselves rad as they toss their own bags of color into the air; creating a display so colorful it makes the Fourth of July jealous. The Omaha/Council Bluffs race is the twenty-ninth stop on this year’s nation wide tour. Inspired by the Holi Festival of India, Color Me Rad is in its second year of turning runners into color revelers. Last year more than 200,000 runners were turned rad in 36 cities across the U.S. and Canada. “We love to get people involved in fitness who may not come out to your typical 5K,” Crandall said. A portion of the proceeds of the race goes to Special Olympics. “We have worked with great charities across the country, and there is nothing more rad than knowing all of this colorful mayhem is also for a good cause,” Crandall said. Waves of 1,000 people will take off every five minutes beginning at 9 a.m. on Saturday, May 11, 2013. Participants of all ages are welcome to run or walk. Registration is available at colormerad.com.